WHAT IS THE MOST IMPORTANT ITEM WHEN GETTING STARTED? It is not uncommon for most business owners to get bombarded with all sorts of offers every day through regular mail and from the Internet as well. These offers are overwhelming for some people. They may be confusing or even paralyze some people. These offers may guide people into doing something that is not productive for the moment. This is especially true for new business owners, including new freight brokers. 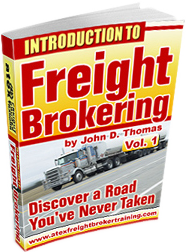 It is essential that freight brokers know what to do and in what sequence. That is, things need to be prioritized. Things need to be prioritized not only by order of importance but also by order of sequence. If something is put off until later it does not necessarily mean that it is less important than something ahead of it. It simply means that there is a special sequence and timing for everything. Landing a rocket on the moon is no less important than the take off. But, taking off is the first item in sequence. So, you deal with that first. One thing that needs to be emphasized in freight brokering is that a new freight broker does NOT need expensive freight broker software to get started. It just won’t help that person build a business no matter what bells and whistles it has. The fancy stuff will just have to wait until later. Then, when the business is established to the point where expensive software is justified – then and only then can you make a wise decision to use it. In some businesses there may be very strategically prepared systems or tactics to get started. In freight brokering there are a variety of tactics but, more importantly, there are some guiding principles to follow. Principles are the guiding strategies that set you on the right path; tactics are various methods to employ within your strategies. Make sure you are on the right path first before you get all wrapped up in tactics. For example, if you are running toward the east looking for the sunset, you have a long, long journey ahead of you no matter what tactics you use. Don’t start running in the wrong direction and do take the time to discover some good guiding principles. The quality of your preparation will determine your outcome. And good preparation begins with quality training.